Testing of new guiding camera at the Dunn Solar Telescope at Sunspot, NM. 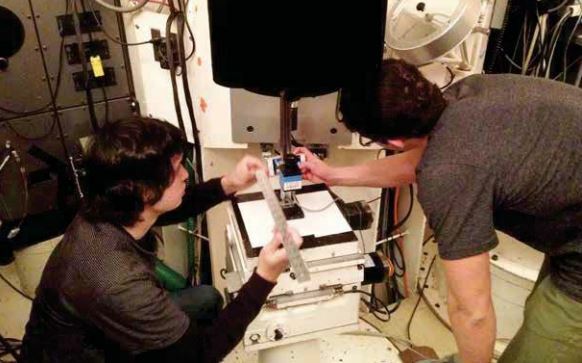 Pictured are NMSU engineering students: Christopher Trujillo and Samuel Horst measuring the focal plane of the telescope. Photo credit: Ethan Dederick. NASA’s critical planetary science goal is to answer the question “How did the Sun’s family of planets originate and evolve?” Jupiter played a major role in the formation of our Solar System. However, the manner in which Jupiter formed is still debated. This is due to the fact that its interior composition and structure is so poorly known that it could contain as little as none or as much as 40 Earth masses of elements other than hydrogen and helium. A similar uncertainty exists for Saturn. For both planets, the mass of their cores – the seeds of planetary formation in the early Solar System – are only crudely constrained by current observations. The large uncertainties in our understanding of these two massive planets that motivate this project. The Jovian Interiors from Velocimetry Experiment in New Mexico (JIVE in NM) is a NASA EPSCoR project whose research activities are designed to address this question and determine for the first time the interior structure and composition of Jupiter and Saturn and to gain new insights into their dynamic atmospheres. This will be carried out by constructing an optimized instrument that is capable of detecting Jovian oscillations to allow for seismic measurements of the planetary interiors and direct inferences of atmospheric winds. It builds and improves upon the successful design of an instrument that provided the first ever confirmed oscillations on Jupiter. Illustration of the VTXO mission concept. This figure shows the positions of the alignment manueverers as well as the segments where the formation is held. The space-based Virtual Telescope for X-ray Observations (VTXO) will consist of two 6U-CubeSats; one carrying a Phased Fresnel Lens and the second an X-ray sensitive camera. The two CubeSats will fly in precision formation to form a very long focal length (> 100 m) telescope: A Virtual Telescope. 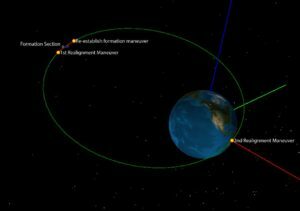 This is intended as a demonstration flight that will showcase the feasibility of the Virtual Telescope approach and raise the Technology Readiness Level to the point where the technique can be proposed for a much larger NASA mission. This multidisciplinary project involves researchers from New Mexico State University and the University of New Mexico working in collaboration with researchers at NASA’s Goddard Space Flight Center. The project addresses two Technology Areas from the NASA Space Technology Mission Directorate’s Technology Roadmap: X-ray optics and multi-spacecraft formation flying, navigation, and control. The science enabled by this technology is closely tied to the Strategic Goals of NASA’s Science Mission Directorate in the Heliophysics and Astrophysics Divisions. This project aligns with two areas listed in A Science and Technology Roadmap for New Mexico’s Future: 1) Challenge #4 Producing more technologists to satisfy projected workforce needs and 2) New Mexico’s Major Technology Clusters – Aerospace. In addition, this proposal supports the workforce needs of LANL, Sandia, AFRL and the Spaceport America. imaged by the Hayabusa probe). This project focuses on the following tasks: 1) Study the spacecraft maneuvers required to enable a NEA sampling mission, including descent and hovering, where a relative equilibrium is created at an arbitrary position by using thrusters to null the nominal spacecraft acceleration (This equilibrium may be an advantageous position for taking high resolution measurements, maintaining a fixed communication, solar panel, or sensing geometry, or for maintaining relative orientation during a maneuver. ), 2) Improve the gravity field modeling of small, arbitrarily-shaped bodies, with a focus on those (e.g. Eros, Itokawa) that have been visited by spacecraft (Co-I Born and his student have recently developed a more computationally effective and efficient method for doing this), 3) Integrate the trajectory design and navigation software currently used at JPL for small body missions into a single package and test it on a simulated mission to one of the above asteroids, 4) Study the problem of attitude control in the proximity of irregular bodies and how it is influenced by translational/rotational coupling, 5) Design numerical schemes that can accurately simulate the relative motion between an irregular asteroid and a spacecraft over long time periods and that can be used for propagation of states during navigation, 6) Develop an autonomous navigation capability in the vicinity of the small body, 7) Develop the control laws necessary to implement touchdown or “touch-and-go” operations at the asteroid surface to support sample collection, and 8) Study the impacts of communications and networking constraints within the framework of various ad hoc protocols on NEA missions. This investigation will be supported with numerical analysis including the use of in-house JPL software programs using models of real asteroids. Special-purpose numerical integration schemes for motion near asteroids have been developed in previous research efforts by co-I Scheeres, which can be used in the guidance and navigation software. Due to the fact that linear covariance may not be valid in such extreme orbital environments, approximation of the true error probability distribution of states and model parameters will be another project focus. In addition to NEAs, these strategies will also apply to missions to other solar system bodies such as comets and small planetary satellites. The NMTech co-Is will leverage the Magdalena Ridge Observatory 2.4-m telescope, dedicated to NEA and other asteroid follow-up characterizations, to obtain observational data for use in the asteroid modeling and simulations. 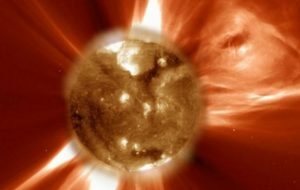 Composite image of the Sun and its extended corona. All of the dynamics and activity of the Sun are due to the magnetic field which is clearly outlined in this image. Helioseismology provides a means of studying the magnetic properties and thus the origin of solar eruptive behavior. Image courtesy of NASA/SOHO. The objective of the proposal is to build the infrastructure needed for New Mexico to become nationally competitive for funding in the field of solar and stellar seismology. These are two of the fastest growing research areas of astrophysics because they provide essential information about the structure of the Sun and other stars that has never before been available. The importance of these research areas is reflected in the number of major current and future NASA space missions devoted to them. These include the Solar and Heliospheric Observatory (SOHO), the NASA Solar Dynamics Observatory (SDO), and the Kepler mission. 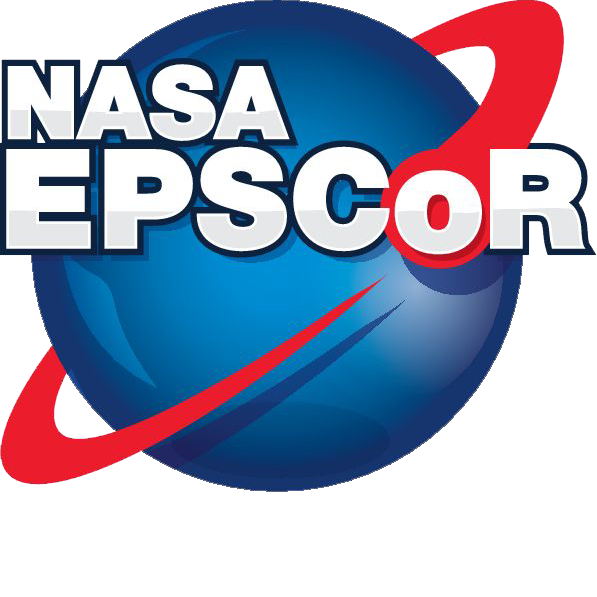 This NASA EPSCoR proposal leverages the scientific talent within the state by forming a partnership between scientists at New Mexico State University, the University of New Mexico, Los Alamos National Laboratory, the National Solar Observatory, and the Air Force Research Laboratory Center for Excellence in Space Weather. Our NASA center partner is the Goddard Space Flight Center. Left: Breadboard of VNIR channel of the AImS instrument. The AOTF is in the brass enclosure in the middle and serves as a tunable narrowband filter. Right: TOF-LDMS mounted in the vertical tube vacuum section, with sample loaded into base chamber that will be adapted to accommodate optical feedthroughs for the AOTF. This proposal seeks funds for the development and field testing of a point spectrometer based on acousto-optic tunable filter (AOTF) technology, for “quick look” in situ detection of organic species at millimeter size scales. Although a convincing case could be made for a stand-alone AOTF spectrometer, our intention is to develop an instrument that can be paired with a miniature Time-of-Flight Laser Desorption Mass Spectrometer (TOF-LDMS) and demonstrate its ability to prescreen samples for evidence of volatile or refractory organics before the laser desorption step and subsequent mass spectrometer measurement. This instrument development will merge the capabilities of two sensors with significant prior investment by NASA, and will result in a powerful tool for astrobiological exploration of our solar system. Aerospace structural systems experience a broad spectrum of environmental and operational loads. Severe and/or prolonged load exposures may trigger the damage accumulation process even in recently deployed structures. The process of implementing a strategy of damage detection for engineering structures is referred to as structural health monitoring (SHM), which seeks to answer questions such as: Does damage exist? If so, what kind? Is the damage local or global (e.g., a large isolated crack or many small defects distributed in the material)? Is the damage in the material or in the joints and connections (or both)? Is overall structural failure likely? SHM is normally based on non-destructive measurement of responses that change due to damage in the structure. Comparisons of measurements made in a damaged and in a reference state allow inference of the type, location, and severity of the damage. Historically, vibration natural frequencies and mode shapes have been the most common such measurements: macroscopic damage tends to reduce the natural frequencies, and mode shapes may be sensitive to isolated damage. Vibration measurements have been used in many ways for this purpose (Doebling, et al, 1996; Sohn, et al, 2003). Three important “new” issues/approaches impacting structural health methodology are addressed in the proposal. The first is to treat SHM as a comprehensive, multi-scale phenomenon in which damage detection may be needed over a spectrum of length scales from the microscopic to the macroscopic. The second issue is attributing to damage in joints and connections an importance commensurate with fracture and fatigue damage that develops in the structural material. The third “new” approach is to develop material self-healing systems (SHS) that could repair material damage while maintaining structural integrity.